The Polti steam cleaner has been approved by the British Allergy Foundation for its effectiveness in fighting against dust mites, allergens and dirt. The Polti steamers are mainly cylinder cleaners with a floor mop and a handheld cleaner to help cleaning floor, worktops, windows and more. The Polti vaporetto steamer is black/silver in color, weighs 6kg, powered by 1800 watts motor and of 25 x 45 x 29 cm size. Has variable steam control setting that allows you to control the amount of steam depending on the surface area you want to clean. Has a powerful 3. 0Bar steam pressure. A bit low pressure when compared to the Polti vaporetto eco pro 3.0 steam cleaner of 4.5Bar steam pressure. Uses kalstop that you can buy for preventing limescale build-up in the boiler for efficient steam flow and longevity of your steam cleaner. Comes with a number of accessories for cleaning floors, windows, work surfaces, patio doors, curtains, mattresses and much more . On the negative sides of the machine, for the steam to be expelled, one has to hold the trigger. This Polti steamer has no gauge to indicate the amount of water left, or when to make a refill. Compared to the steam mops that heats up in seconds; this Polti steamer takes ages 5 to 10 minutes. You also have to wait for it to cool down before refilling it for the second time. Generally, the Polti vaporetto comfort is of high performance and efficiency when it comes to cleaning job. This has been evidenced on Amazon and blogging sites, by the many positive feed-backs from customers who have already used the machine. Has a steel boiler, which generates steam under high pressure for the purpose of dirt dissolution. Helps one to save energy and a significant amount of time, since dirt can be dissolved by one powerful blast of steam (dry) from the machine, leading to perfect cleaning with less effort. Is small but very versatile, with a variety of accessories that give you all the ability to clean every part of the house, including the stressful parts like sink edges, toilet seat fittings, white kitchen worktops, bathroom tiles, leaving them sparkling clean. It has a general rating of 4.0 on Amazon. This clearly shows that more than 76% of the large population using this product are very satisfied with it, hence it definitely cannot be a let down to new buyers. 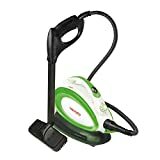 If you are looking for a small and versatile steam cleaner and don’t want to spend a fortune then this is it. The Polti Vaporetto Eco Pro 3000 Steam Cleaner, Blue/ White is one of the top rated steam cleaners out there that has a ‘Seal of Approval by British Allergy Foundation‘ in its effectiveness against dust mites just like the Polti vaporetto comfort steam cleaner. The Polti eco pro is blue in color, weighing 4.9kg and of 32 x 32 x 34 cm size. Has a large 2 litre water tank that heats up in 5 to 10 minutes to give you 40 minutes cleaning time. This is enough time to clean most areas when compared to best steam mops that only offer between 15 to 20 minutes steaming time. 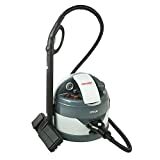 It is powered by 2000watts motor and has a powerfully 4.5Bar steam pressure great for deep cleaning hard floors, cooker, work surfaces, shower, car seats, children toys and anything real that can be steamed. Its powerful pressure can be regulated through its variable trigger. Most models are not able to deliver such variance in usage. Gives a buzz when water runs out. You get an iron attachment option available with this steam cleaner thus making it more user-friendly. The product also comes with a safety cap that will not open unless the pressure is completely depleted – hence, ensuring you safe sanitization. The Polti Vaporetto Eco Pro 3.0 Steam Cleaner, Blue/ White offers adjustable hot vapour control (Variable floor control). It comes with a stainless steel boiler. It comprises of a large tank to clean for a longer period. Ensures risk free usage with a safety cap. The ecopro comes with an instructional DVD for maximum output. It works skillfully on even the toughest surfaces. Its 4-bar pressure and a large water tank, lets it generate hot vapour for you in minutes. It is highly durable. It packs a powerful machine with exemplary built standard. This is because it comprises of a stainless steel boiler which gives it a premium look with excellent sturdiness. You have to wait for the steamer to cool down before refilling it. Unlike most gadgets, the Polti Vaporetto Eco Pro 3.0 Steam Cleaner, Blue/ White packs power, versatility, and multiple accessories. Tools like the concentrator and squeegee kit help in cleaning surfaces from the toughest to the most delicate ones, hassle free. Over 82% satisfied customers have rated this incredible machine with 4.4 stars on e commerce sites such as Amazon. This explains what this capable unit delivers when you use it on your house tiles and floors. The only ecopro flaw might be the high price, but that can be obscured when you attain such exceptional features which are worth paying for. This machine is worth buying for your deep cleaning and sprucing up.